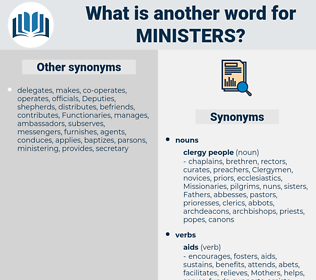 What is another word for ministers? interministerial, interdepartmental, inter-ministerial, governmental, primer, co-chairpersons, leaders, authorisation, incumbent, incumbents, Sharon, owners, involvement, december, second, october, elders, there, charter, participants, association, co-chairs, accountable, participation, enclosure, delegate, delegates, non-proliferation, openness, privy, no., organs, opening, MRT, Them, cohesion, Their, expert, experts, pervez, rev, continuation, keynote, continuing, taxation, appendix, america, european, banks, wise, PRI, Delegated, pursuit, cm, concerned, nuclear, status, voting, events, legal, meetings, violation, bank, Vlad, -rrb-, breach, ', They, zaken, accord, discussion, schedule, Were, uganda, who, are, P, have, tax, c., Has, ministre, union, vote, VOTES, *, ?, Bodies, +, focus, 1997, chairman, Chairmen, prime, chief, chiefs, ministro. 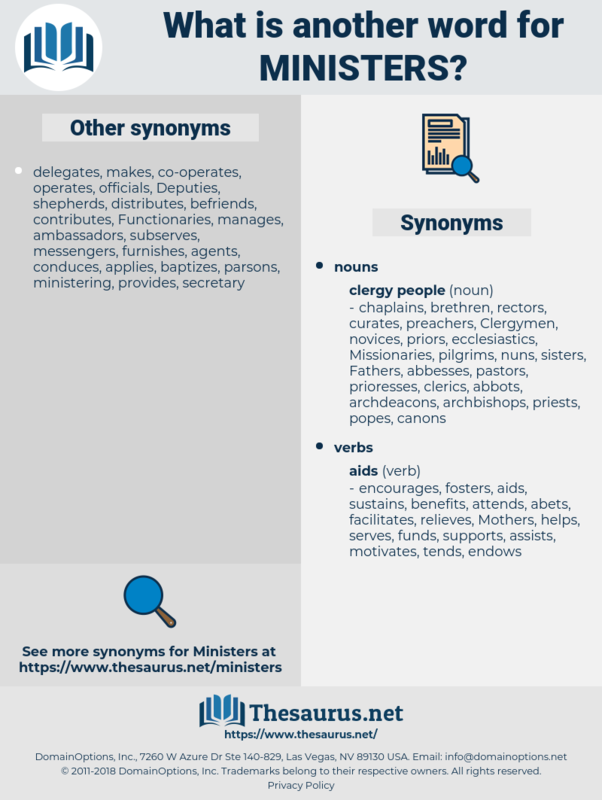 representatives, authorities, speakers, terms, administrations, relations, managers, priests, matters, magistrates, servants, directors, Deputies, justices, statements, conditions, keepers, officers, declarations, counsellors, portfolios, preachers, Consultations, pastoralists, sectors, scenarios, clerics, pastors, peers, makers, L, prosecutors, herders, positions, provinces, officials, Rights, Guidelines, talks, guests, brussels, things, judges, statistics, issues, vicars, Organizations, points, perpetrators, Parents, questions, posts, communiques, Judgments, held, aspects, shepherds, decisions, abroad, Areas, forces, clergy, colleagues, holding, Efforts, levels, Conferences, conflicts, men, discussions, actions, wallets, dialogues, problems, Activities, facts, 2003, =, cases, leaders, participants, co-chairs, enclosure, delegates, banks, status, meetings, -rrb-, have, VOTES, ?, Chairmen. agreement, adviser, resolution, expertise, response, aftermath, crime, planning, decision, today, course, role, interdepartmental, analysis, research, step, year, change, formula, attention, war, primer, discussion, ministre, chief. committed, agreed, approved, said, held. endorsed, Discussed, approved, prepared, adopted, Passed, held, taken. minster, ministry, ministries, ministerial, president, presidents. The Minister of Marine has besides addressed a very kind letter to myself, and I have also had the like honor shown me by the other Ministers. A great many people, she noticed, talked at length about it; women in their best wraps and with expensive little prayer books left the hotels for various Sunday morning services, and ministers came in later for tea. Ming Tree, Mens Store, ministry, muster, musketeer, messidor, moisture, make water, mixture, minster, manchester, mister, mouse deer, monastery, master, monster, mango tree, muenster, mystery, mass hysteria, musk deer, musketry, mastery, megathere, myocastor, mycteria, Masseter, maestro, monstera.